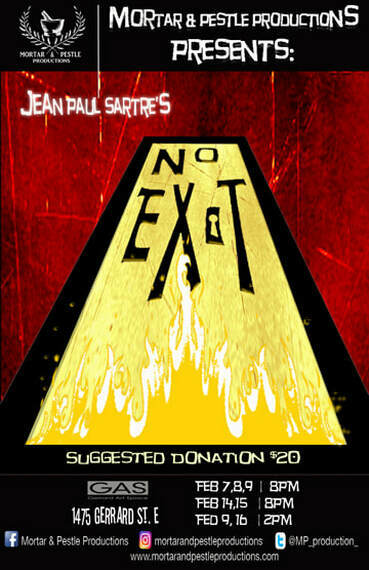 Mortar and Pestle Productions presents Jean-Paul Sartre’s No Exit at the Gerrard Art Space this month. Evening performances will be held on Feb. 7, 8 and 9, and Feb. 14 and 15 at 8 p.m. Matinee performances are slated for Saturday Feb. 9 and Saturday, Feb. 16 at 2 p.m.
No Exit is a French existentialist play written in 1944 by Sartre. It tells the story of three souls stuck in purgatory, Vincent Cradeau, Inez Serrano and Estelle Rigault. The Gerrard Art Space is located at 1475 Gerrard St. E., just west of Coxwell Avenue.